shallotsometimes | Experimental cooking by a meat-lover going vegetarian…maybe. Experimental cooking by a meat-lover going vegetarian…maybe. So that went… as expected. No, that’s not entirely true. I expected to do better. I always think I will have more time, and more determination. But if I was honest with myself, I knew how it would go. I made it vegetarian through Thanksgiving, but I caved in for my mom’s roasted duck on Christmas Eve. It was amazing. So were the morcilla and eggs I had the next morning. I regret nothing! Nothing involving those two days. The rest of the break I had no excuse. I lost my head to the holiday spirit and my passionate love for sweets. I’ve learned a few things since my last entry on this blog. 1. I’m really, really slow. The turtle in Steinbeck’s The Grapes of Wrath could cross the road faster than I cook. 2. Even if I hide it in other things, Finick will not eat chunky, vegetable-like things. Even if they are soft. Even if he ate soup made from the same ingredients. I made a mean vegetarian lasagna with hazelnuts and butternut squash, and he wouldn’t have it. He’s become remarkably suspicious about what things are made of, so now I just say, “Healthy things.” As long as he can’t tell, it’s better if he doesn’t know. 3. I’m overly ambitious in the kitchen. I need to stick to simpler things (except for baking, which I love and am pretty good at). I was doing well with soups and stir fries but I started experimenting and it went downhill from there. The simpler stuff is easier to burn off, too. 4. I am obsessed with peanut butter. That’s not really a lesson, just a discovery. 5. I need to ready/study recipes more carefully and be more patient (in general). The holidays weren’t good to my waistline. I was on a roll with the exercise and the healthy eating. I’ve been trying to get back on that train the last month with some success, but I lack the security and determination I felt. I’ve been pretty good the last couple of days, finally getting back in control. I said no to the chocolate cake from the office pre-Super Bowl party (though I gave a resounding two-sliced YES to the spinach and ricotta pizza — heaven help me, it was divine). When Finick crunchily ate from a can of sour cream and onion Pringles right next to me, I resisted. I even calmly lied that it didn’t bother me that he was eating them right next to me. I don’t mind in principle, but I wanted to sayshout something like, COME ON, LIKE YOU HAVE TO ASK. WHAT KIND OF JERK…etc. Sometimes he is so infuriating. The last couple of days have been pretty good on the food front, but I feel like I need to take it up a notch. I’m going to see how many days I can go without eating bread. My original was 30 days but not only is that daunting, I know for a fact I will be eating pizza for my friend’s birthday party in a week. But that aside, I want to give it a shot. No cake, no bread, no wrap, no cracker of any kind. My goal isn’t to go without bread indefinitely (did I mention I love baking? ), but to reduce the amount I consume. I’m probably not mentally or physically prepared for this, but when would I be? That’s why it’s a challenge. This is only day 2. Onward! A big challenge for me has been the diet of the people around me — particularly that of my better half (I’ll call him Finick). “No. Don’t feel bad for me,” I said, dragging my eyes back to my own very tastey plate of thai eggplant and black rice. It was one of the mistakes I used to make, oh, about 15 years ago, when I first heard of vegetarians. (You don’t really run across many vegs in a Hispanic community, at least not in the ’80s, and when/ if you did, it was harshly frowned upon as an unhealthy diet.) It took a lot for me to realize that it’s not a pointless deprivation. Vegetables are amazing and there are so many ways to prepare them. But back to the dinner table. Once I started eating I lost all interest in his food. Poor Finick. He’s not just another meat-and-potatoes type of guy. I rolled my eyes when he first mentioned food sensitivity. But watching him eat (or not), after a while I couldn’t ignore the insanity the peculiarities of a severe food texture sensitivity. When it comes right down to it, I think he’s the one that’s deprived. There is so much food he can’t eat and so much he won’t even try. How am I going to reconcile the lifestyle I want with his needs? With the palate and fastidiousness of a child, getting him to eat fruits and vegetables regularly, in a way that he can stomach and I can still eat, will be a challenge. I figured soups were a good place to start. The heavy, creamy, sodium-rich soups he’s used to aren’t an option. I had to find a soup that was fresh and had lots of veggies but was smooth and didn’t have an overwhelming flavor. To that end, I tried out this recipe from La Tartine Gourmande. It was actually really easy to make because I used pre-cut butternut squash from Sprouts. I loved that it’s a thick soup and the texture reminds me of my mom’s creamy carrot or tomato soups, but it’s still vegan (if you omit the creme fraiche like I did). Best of all, it got the Finick stamp of approval. I know he won’t always try the things I make, but at least soups seem to be the easiest way into his stomach. I made the soup a second time for Thanksgiving dinner with my family (it was a big hit with them as well), and I had to peel and chop the squash myself. I nearly lost two fingers but I have to admit, I think the soup turned out better with the fresh squash and that is probably what I will use the next time I make it—though I will chop very carefully. I’m very curious what this soup will taste like with other types of squash and I look forward to experimenting with it. Milk was the first thing I gave up, and it has been much easier than I thought. I haven’t been tested against ice cream yet, true, but I used to drink milk daily and I’m lucky to live in an age when there is great demand for vegan/vegetarian products and milk substitutes abound. Much more difficult to kick has been the main source of my former milk consumption: caffeine. Coffee, espresso, tea — I love them all. Starbucks used to be reserved for emergencies and occasional treats until I got sucked into the gold card vortex last year. I did try drinking caffeine-free herbal tea but it doesn’t satisfy in the morning. It’s too relaxing. I did reduce my consumption drastically — because reloading my card twice a month is not acceptable — but I feel like I’m giving up so much already, I’m just not ready to give up caffeine completely. The switch to soy milk was easy. I actually prefer my lattes with soy milk, but that presented other problems. Lattes, and even good old-fashioned coffee, are already an expensive habit, but those assholes at Starbucks no longer give free soy milk to gold cardholders (what assholes!). I also just don’t want to consume that much soy. Soy seems to come up constantly in a vegetarian diet, I don’t want to drink it too. I decided to try buying an espresso and adding my own almond milk, since it’s a good source of calcium. I DO NOT RECOMMEND IT. It wasn’t horrible, but that’s the best I can say about it. Next I tried switching to black tea. 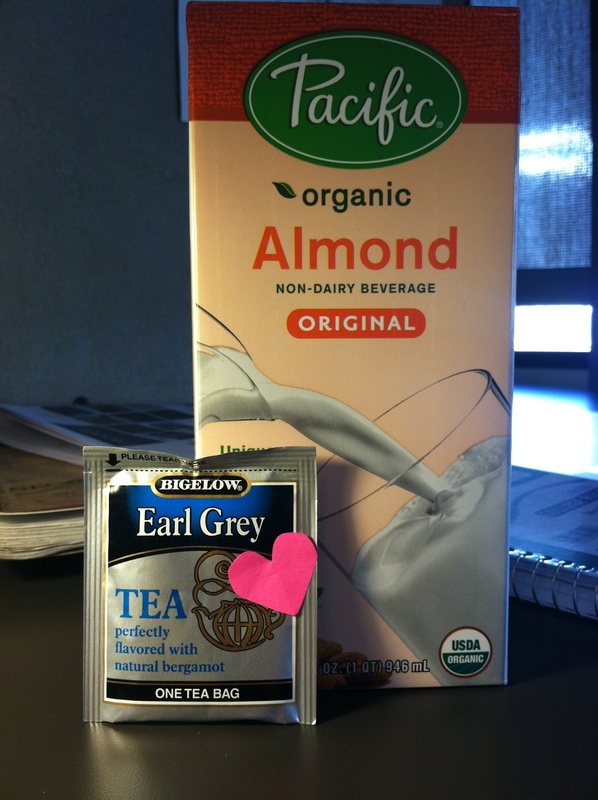 I love a good English breakfast tea, but that was equally distasteful with almond milk. My first success came when I was poking around the office kitchen and I noticed the stash of earl grey. This is a combination I can stand behind, and it’s become my usual go-to when I feel like I need coffee. It’s great, too, because I don’t have to leave the office or pay for the tea.